my daughter is a horse lover (also a pink lover), and has been begging me to make her a "horse blanket" for at least a year. Her 6th birthday was last week, so I surprised her with this quilt. She only kind of cared. I guess a quilt is only a little exciting to a 6 year old. I collected as many horse prints as I could find, and struggled with a design that would look good with all the prints (many different styles) and finally decided on a wonky star quilt. I used several different pinks for the background, and think it looks okay. Some of the busy pinks are too much, but I was using my scraps, so i'm happy with it.. I found the backing print a while ago knowing she would love it. It's my favorite part. I LOVE this print (stable mates by alexander henry). can you tell she likes pink? wait, the backing isn't my favorite, the binding is. Lately I have really been loving white striped bindings. LOVING them so much. Nettie, this quilt is so delightful! I would be hard pressed to choose what I like best about it... but oh, all those horses and paired with pink?...be still my girly, horse loving heart. I bet your daughter will cherish this beautiful quilt, if not right now, very soon. It's awesome. My 10 year old daughter has the quilt my mom made her when she was a baby. She loves it now. Such a cute quilt! I think this quilt will become a favorite quickly! The quilt is delightful and shows how much time and effort you have put in to find horse prints to do all this. This is a gorgeous quilt and she will definitely treasure it in years to come. oh wow this is amazing. i love that you have all the horses in it for her...the back is so fun. i love a wonky star...it is one of my favorite. 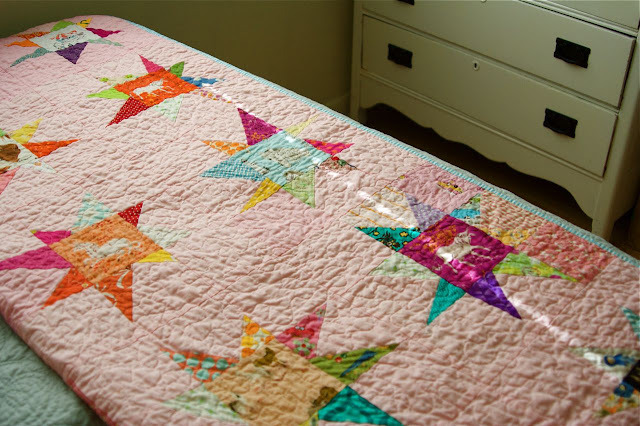 i have been thinking about making a star quilt for myself for awhile and yours is the third amazing one i have seen in blogland today...you all might be giving me that little push i need. Loving it!!! Esp the right off stars!!! i bet she'll treasure it always! i love the varying pinks in the background. and i always love scrappy stars. i adore this!! so fun! the combo of colors with the fussy cut horses has me feeling giddy! I love this quilt, and I'm sure your daughter is floating, but not expressing how much she love it. I love this quilt. So precious! It's gorgeous and I guarantee she'll end up loving it forever. My first quilt was for my daughter. I gave it to her and she liked it for about 5 minutes then she wanted to only use the backside (basic print). She was like that for a couple of months but now LOVES it. Nobody else is allowed to touch it. 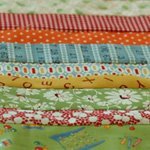 your quilts just rock my world- really they do! This is so precious! the patter is great with these prints, and the random pinks is my favorite part! LOVE! lol at little exciting, it kinda gets like that. I have made my boys there winter quilts this year in colours and pattern of there chocie, no more kid print doona cover's allowed now they are "men" at the grand age of 10 and 11, lol. this is gorgeous, gorgeous, gorgeous! i want one for ME! Oh gosh that is too too adorable, pink is perfect. So sweet. Isn't that anticlimactic reaction a bummer? Well, I'm excited for her! My daughter is 27 and she'd love that quilt, ha! I love the fabrics and colors you chose, really beautiful. way cute net!i love how the horses each have a name. lucky morgy! That is my favorite star quilt so far! And, yes, the binding is awesome! I make myself quilts and pretend they are for my kids....cause my kids don't care. I love the way this one looks with all those bits of different fabrics...very Nettie style lovely. This is adorable! I love the different shades of pink that you used for the background... it adds so much interest without being distracting. what an adorable quilt! 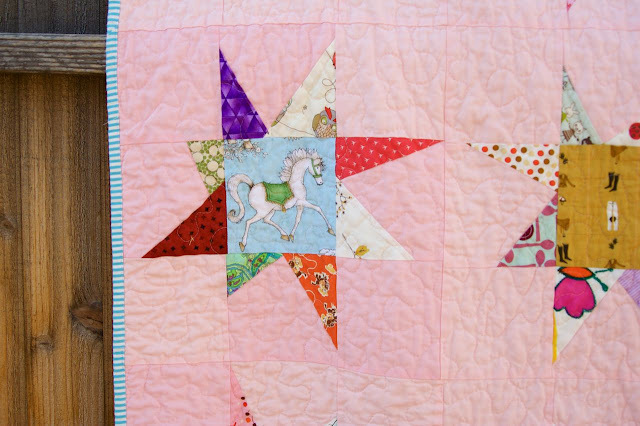 I love those horse prints you featured in the center of each cute wonky star block. That backing fabric is the bomb! I bet you had fun putting this one together. Just know that your daughter will grow up to appreciate this more and more. She's a lucky girl! Such a cute quilt! She might have only kind of cared now, but she'll treasure it for years! And maybe she'll give it to her daughter some day?? I've this quilt! My daughter is a horse lover as well and I'm planning to make a horse quilt for her birthday. I have to ask where you were able to find the horsemates print. I've looked around and haven't found anything I loved as much as that. Hi Nettie, I read your blog all the time on Bloglines (beautiful quilts, and I love them all! ), but I've never commented before this horse quilt. I love it! A friend's daughter loves horses (and purple! ), and I just decided to start collecting horsey fabrics now in anticipation of making her a quilt just like yours. I echo some of the same questions already asked...what is your star pattern as far as size of middle block and size of the wonky blocks. And did you find the backing on the A.Henry site? I'll have to check. Thank you so much for sharing such a work of art! Love the binding, too! Wow! That is the most gorgeous quilt ive seen in ages! I really, really , REALLY love it! What a gorgeous quilt with all its crinkly goodness...What girl wouldn't love it! I love this quilt! Seriously, it has all the great elements, love the scrappiness, the star/horse theme going on, everything about it. Thanks for the inspiration. 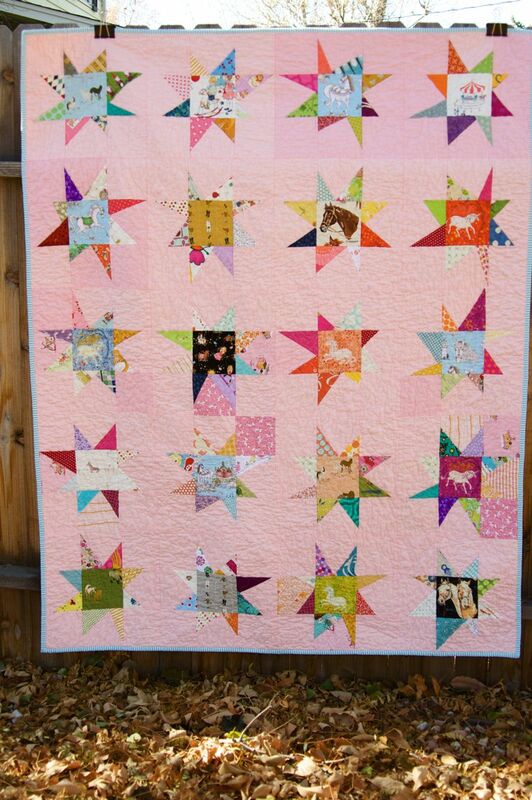 Nettie, this quilt is gorgeous...love the wonky stars with the horses in the middle. I love all your fabrics and all of the pinks! What a perfect quilt for a young horse lover. She will grow to cherish it! Oh I love it! What a cute front and back! What a lucky girl! I love horses too! Beautiful quilt. That is such a great quilt - I'm super impressed with all of the different horse prints you managed to find!...and the fabric on the back! 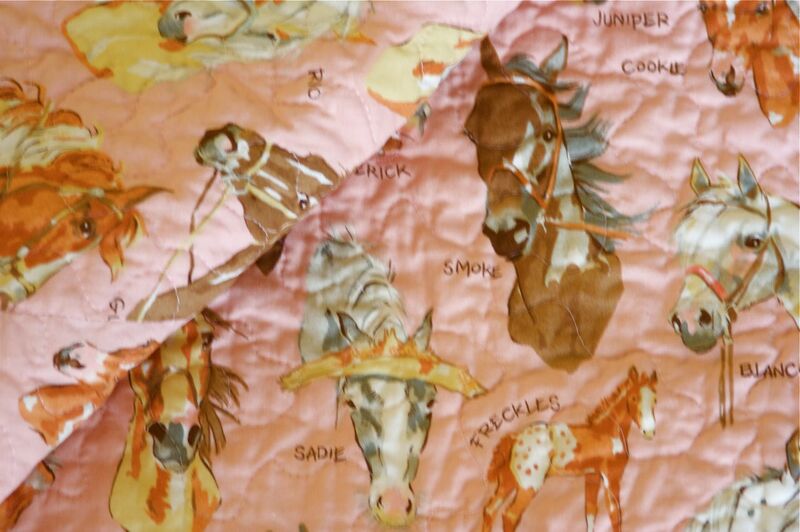 My horse daughter has long since outgrown pink, but I think a quilt like this will be special forever. I really like this quilt! I so need to make my own wonky star quilt -- this just looks so great! so beautiful! 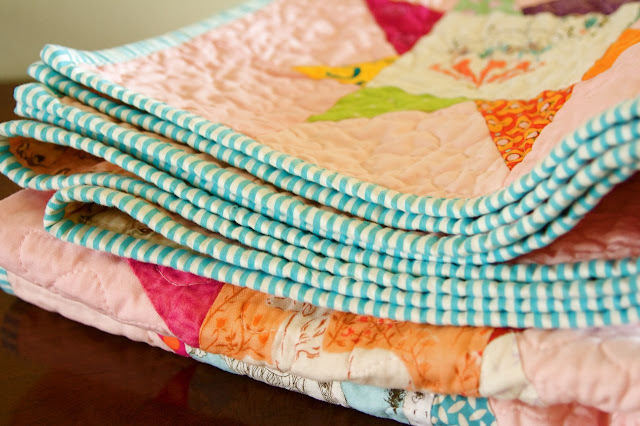 Can i just say, i love the way you put together your quilts, it's so innovative, i always come to your blog is i ever am in need of some quilt inspiration! Adorable quilt! My daughter would love this - too bad she shares a very gender neutral room with her brother :) I love that blue binding with the pink especially. i love that it's like her original baby quilt. she will love it! this is so pretty! very unique and creative, and that binding is perfect. I think this quilt is awesome! Even if your daughter might not totally appreciate it right now, she will definitely treasure the quilt later. Especially since it will be a reflection of her interests in that time of her life. 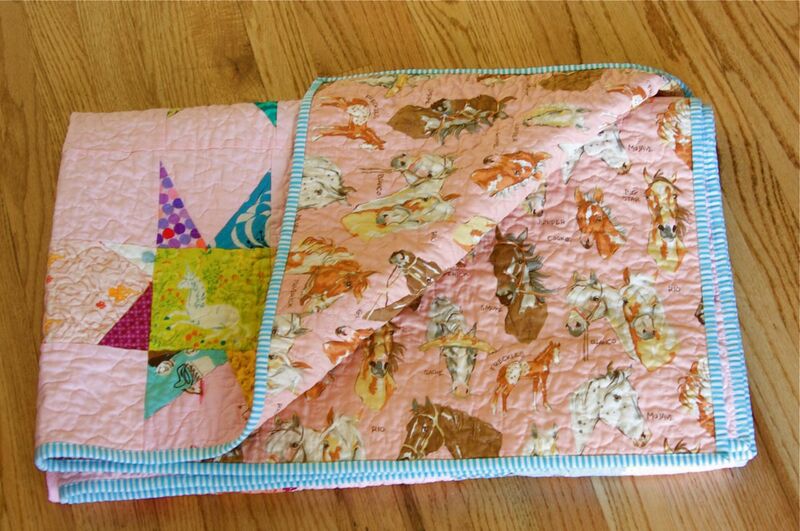 What a wonderful quilt for a horse lover! I bet it will be a prized possession. The wonky stars are such a great choice for binding together the different horse themed fabric. 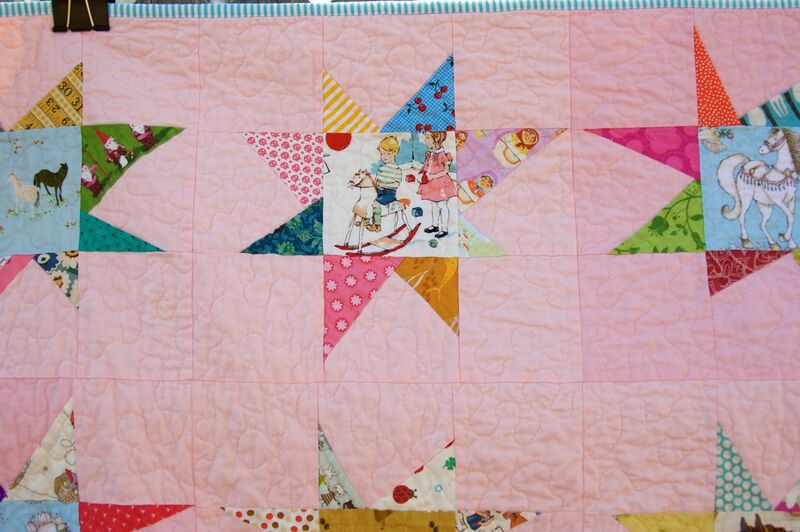 Lovely, girly quilt! Nettie, this is awesome, also love that Crosswalk Quilt! This quilt is outstanding! I love the fussy-cut horses and the pink is perfect! I am sure that she will love it forever. This quilt is Uh-Dorable! I love how its horse-themed, without it being too cowboy/westerny. Love it! This quilt is just delightful in theme and colors! Super job for a free and FUN quilt! Love your blog! Arg, I found this to late & cant find that backing fabric!!! Any ideas where I might??? My grandaughter would love this as she is nuts about horses. Do you have a pattern for the stars? Lovely quilt. Thanks for sharing it!